This beautifully maintained family home is sure to impress. Perfectly positioned in a quiet street and surrounded by quality homes, the home features contemporary styling and offers 4 good sized bedrooms, with ensuite to main, generous living space that includes a separate rumpus, impressive galley kitchen and the comfort of ducted air conditioning. If you enjoy entertaining, you'll love the gabled pergola, that flows easily off the family living area and the yard offers plenty of space for the kids or dogs to play. 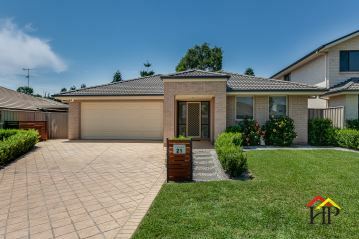 This terrific package comes complete with a remote double garage and we are sure that you will want to call this home. - 4 Bedrooms - Ensuite to Main Bedroom - Generous Living Space For The whole Family - Ducted Air - Quiet Location - Close To Shops - Perfect Family Home ALL PROPERTIES ARE AVAILABLE TO INSPECT 7 DAYS A WEEK AND AS ADVERTISED Harrington Park Real Estate have in preparing this information used our best endeavours to ensure that the information contained herein is true and accurate. Prospective purchasers should make their own enquiries to verify the information contained herein.